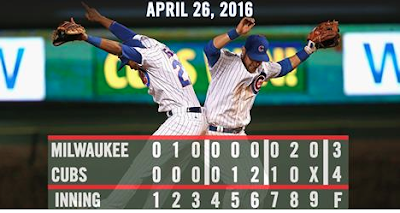 What Happened: How many times have you seen this happen so far in the 2016 Cubs season: The Cubs get shut down offensively for the first 5-6 innings by some scrub pitcher and then all the sudden they bust things open in one big inning and end up scoring 6 runs in a final that doesn't look like the game was ever close at all? That's how this game looked like it was going for a while, with the Cubs pretty much ineffective against the Brewers Jimmy Nelson through 5 scoreless innings (the cold weather helped). But right when it looked like the Cubs could bust the game wide open, loading the bases with one out in the 5th, all they could do was scratch out one measly run off a Fowler sac fly that might have been a home run on any other night that didn't feel like it was below 40 degrees. The Cubs would tack on three more runs on an Addison Russell (hustle?) triple in the 6th and a Rizzo RBI in the 7th before things got interesting. After a Ryan Braun pinch hit, 2 run double made the game 4-3 in the top of the 8th, the Cubs bullpen stepped in and locked things down and the Cubs won, which is good because the Brewers are awful and good teams beat bad teams, especially at home. Game MVP: I'd say that this was a collective team effort, so no one person sticks out more than any other. The weather was really helpful in making sure that everyone in attendance drank a ton of beer to forget the cold which can then be used to pay Jake Arrieta ludicrous amounts of money for his extension. Game LVP: Tommy LaStella. It's well known around these parts that I hate Tommy LaStella and when he's somehow involved with the Cubs doing well, I hate him even more because of his attempts to make me hate him less. Awesome Stat of the Day: The Cubs are now 10 games over .500 after just 15 games. Last season, they weren't 10 games over .500 until game 104. Thanks, super easy April schedule! Game two against the Brewers happens at 7:05 CST tonight with Jake Arrieta taking the mound for the first time since his no-hitter last week. He'll be opposed by Taylor Swift Lautner Jungmann, who has an ERA quickly approaching 9.00.